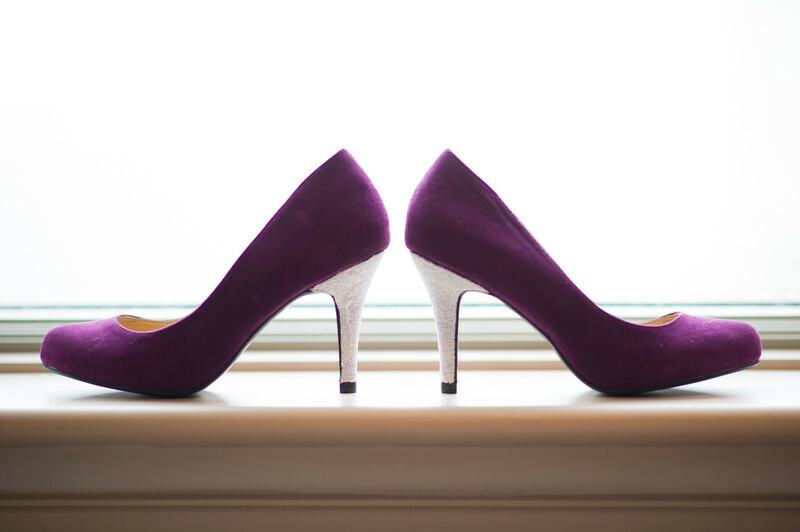 This photograph of the brides wonderful purple wedding shoes was taken at the Peak Edge Hotel in Derbyshire. Images of the details of items you have chosen to be part of your wedding day help in retelling the story of the day in the future as you look back on the memories. Our aim is to capture as much as we can of all the special items which go to help make your day so special. Many of the items you will have will have been chosen specifically for your wedding day, many others will be of sentimental importance, they all tell a pert of the story of your day. I love the colour of these shoes, they are absolutely amazing! We get to see all sorts of wonderful footwear chosen by brides for their wedding from amazingly coloured shoes like these to sparkly high heels, trainers to boots we have probably seen everything in terms of footwear. It is your choice to pick something you like that means something to you, just remember to pick something comfortable as they will be on your feet for a long time. It is also worth bringing some spare shoes that are good for dancing, assuming of course that that is your thing!